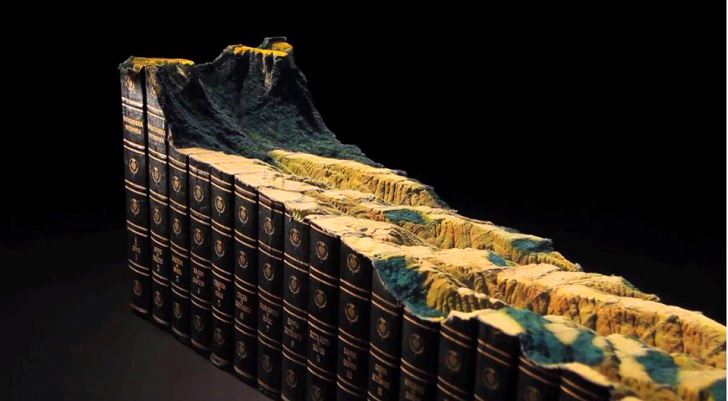 Guy Laramée’s amazing lifelike landscapes, architecture, and iconic sites carved out of stacks of books have become famous with art and book lovers. His latest work entitled ‘Adieu’ is inspired by the announcement that, after 244 years, Encyclopedia Britannica will cease printing their famous book sets. 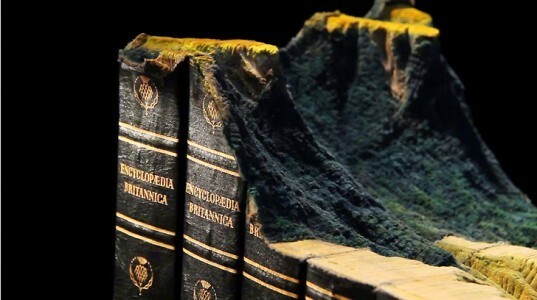 He took an old 24-volume and transformed it into a mountainous landscape which, seen up-close, bears remarkable resemblance to real world grasslands, hill slopes and prairies of Ecuador, Peru and Brazil. Using similar techniques applied to previous sculptures, such as The Great Wall and Guan Yin, the artist created an entire mountain range inspired by his travels to South America. The majestic landscape was created by carving, slicing, gluing, stacking and collaging the pages of the Encyclopedia Britannica, and meticulously detailed to represent the lifelike texture and topography of exotic landscapes. Symbolically entitled ‘Adieu’, the sculpture is an homage to the long tradition of printing the world’s most famous general knowledge encyclopedia. After more than two centuries, the once coveted print edition of the encyclopedia came to account for a small percentage of Britannica’s revenue and the company decided to stop the presses and focus on its online presence. The artist used techniques similar to those applied to his previous sculptures, such as The Great Wall and Guan Yin. He created an entire mountain range inspired by his travels to South America. The majestic landscape was created by carving, slicing, gluing, stacking and collaging the pages of the Encyclopedia Britannica. Symbolically entitled ‘Adieu’, the sculpture is an homage to the long tradition of printing the world’s most famous general knowledge encyclopedia. After more than two centuries, the once coveted print edition of the encyclopedia came to account for a small percentage of Britannica’s revenue and the company decided to stop the presses and focus on its online presence.